Bo asked recently: What is your sudden fascination with Henry Cavill? I don't get it. I grinned and giggled when he asked me this, I just can't help myself. I then explained, and he rolled his eyes and said 'Ah of course' and that was that. It left me with another grin and a frown all at the same time. See, when I write I need a face sometimes to help me see the character in my head more clearly. 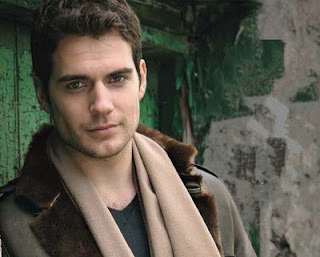 You guessed it, Mr. Cavill is the 'face' of my character. Whenever I can't see my character, or need to imagine an expression, I head over to a pic or a video of this man and voila problem solved. He's not the exact image I have in my head, but he's close enough to make me happy. Since I'm writing a story about falling in love, and I'm oggling this hottie on a daily basis sometimes, I've developed a slight crush on him....or the 'him' from my story anyway. If I EVER ran into this man, I'd have a hard time not touching him or kissing him or ripping his clothes off....ok sorry way sidetracked now. Which is a good thing, I need to fall in love with the character or I can't make it believable. But that's also the bad thing, because now I'm all aaaahhhhh Henry and it's not even real. Plus side, I know it's not real ha. I find it a relief to read authors explanations of how they make their characters real to them, because I'm doing things the professionals do. Yet it feels a bit strange to know I have this major crush on a man I will never ever meet, only because he's the face of the man I'm creating. It seems wrong to be THAT into my imaginary world. Although the second I see his face or hear his voice I don't care anymore, I'm grinning like a fool and happily content. You can imagine I'm ecstatic to see Immortals, it opens tomorrow BTW, and we've made plans for a date so I can get my half naked Henry fix. My hubby is a kind and loving one, to take me to see a movie of a man I've openly admitted to having a massive crush on. The creepiest/coolest/craziest part of this whole using his face is that I occasionally have dreams of him, except he's not Henry Cavill, he's my character. The things we do...ah that's a story in and of itself my friends.